The aim really is that pupils should be able to get a good few correct with the harder ones there to sort out winners. At the end of each round there is a slide with a fact about Advent which pupils may find interesting. This quiz is roughly suitable for middle and senior pupils in the primary school, from 3th to 6th classes. If you are doing the quiz with a variety of classes, try to have pupils from different classes on the one team. So, for example, try to have at least one pupil from 3rd, 4th, 5th and 6th classes on each team. The quiz is very suitable for the IWB in the classroom or in the school hall with laptop and digital projector. The aim is that pupils will enjoy learning a little more about Advent and Christmas with a little competitive element thrown in. Please let me know how you organised your Christmas Table Quiz and how your pupils got on with the questions. You can choose to download the file by clicking on either of the links below or to view the quiz in the embedded Slideshare. Above all, have fun! 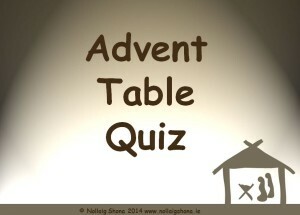 There is a Christmas Table Quiz Answer Sheet on the site which you can download and use for this quiz. As always a useful resource, just great for near the Christmas holidays! !